There are some five or six planets ( besides the sun and the moon ) with Brihaspati at their head, who are held in esteem; Rahu desirous of figuring in special valour does not show enmity towards any of them. The Lord of the demons ( Rahu ) though he has nothing left him of his form but his head, devours at conjunction and opposition only the splendid ruler of the day and the lord of the night. Mark this, oh ! brother. किसका जन्म सफल है? 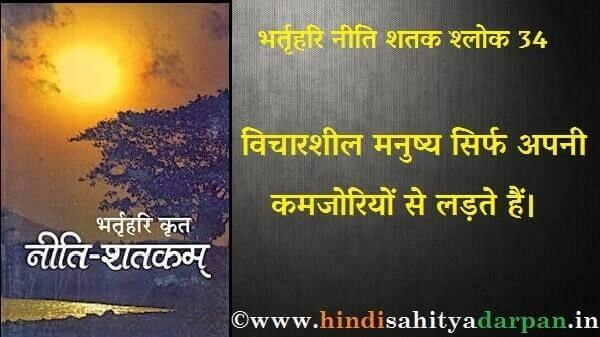 ~ भर्तृहरि नीति शतक श्लोक 32! High minded people fight with their real enrmy-bhartihari neeti shatak, विचारशील मनुष्य सिर्फ अपनी कमजोरियों से लड़ते हैं ~ भर्तृहरि नीति शतक श्लोक 34,Bhartrihari neeti shatak shloka with hindi and english meaning.